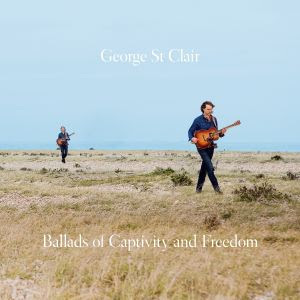 The American singer, musician and composer George St. Clair has been living in England for several years, but grew up in Texas. His family worked on the local oil fields, so the young George has already received a proper dose of so-called hard life with hard work and poor pay. At some point he moved to Austin, Texas, where he got his real baptism of fire as a live artist. He has been working as an archaeologist and anthropologist for over twenty years, leading him through several southern US states and Mexico, before moving to Europe. However, the music never left him like his homeland, so he moved back to the USA for the recordings of “Ballads Of Captivity And Freedom”, more specifically to Richmond, California. And if that was just good for finding musicians with the right feel for St. Clair’s songs and style, then that step was well worth it. The American puts on the twelve tracks presented here wonderful, melodic Americana and Roots Rock songs that are far from being smoothed or set up. With the usual organic instruments recorded, it is in addition to the high-quality performances of the session musicians above all again and again the vocal melodies that go very well in the ear and stay there mostly for a long time. In addition to piano, bass and drums, the acoustic guitar is the dominant instrument. The icing on the cake comes mostly from the pedal steel guitar, which rounds off the pieces again and again. Lyrically, George St. Clair is about interpersonal issues, but another big point is the relationship between the original American inhabitants and the so-called ‘white’ population. The above style designations suggest it already: Here are of course many country influences in the game, but also folk and singer / songwriter bonds are represented. The very successful mixture of these genres then makes the disc the one it has become. The pedal steel guitarist Dan Lebowitzbut also brings an electric into the game, which of course does not hurt. For example, “Cynthia”, which is otherwise only supported by the acoustic, the bass and some percussion, has a vocal line to die for, and a ton of feeling. And before I forget it: A good pinch of Westcoast is also in there. George St. Clair does not (yet?) Have a big or well-known name, but you should definitely check “Ballads Of Captivity And Freedom”, if you are on very good Americana and Roots music. 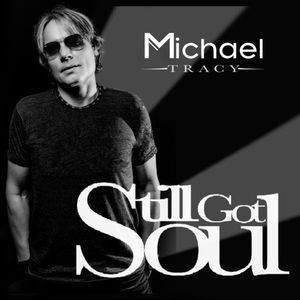 In 2011, Michael Tracy started his musical career as a singer / songwriter. That was on the occasion of a live performance in Charlotte, North Carolina. Already in the same year appeared the first album, “Enough Small Talk”. Four more records followed and now there is the new, “Still Got Soul”. Tracy presents wonderful melodic old school rock full of harmonies and predominantly beautiful sound in widescreen format. A rich sound reminiscent of musicians like John Mellencamp , Bob Seger , Tom Petty,and occasionally coupled with the kind of music presented by Boston or Asia . This has resulted in a combination of typical eighties rock with an occasional touch of Westcoast Rock. Here you can listen well and relaxed and feel good. Anyway, you can feel how much Tracy is standing behind the songs with his soul and heart, always eager to convince a pleasant sound that quickly grabs and takes you as a listener. So the pleasing compositions have succeeded, albeit no masterpieces, but with a guarantee for a beautiful listening experience. “Two brothers, Skip and Evton of Indubious, are now presenting their fourth album “From Zero.” This album is not to be taken for granted, because both were born with cystic fibrosis and had received rather gloomy predictions from their doctors on their longevity since early childhood. People affected by this disease have to be connected to oxygen during the day, in the car and at night, but through brave resilience, it is all the more pleasing that the two musicians are able to sing. If the band Indubious , which originated in Portland, Oregon, simply defines their music as Reggae, it would certainly not be wrong. The special underlying rhythm is anchored in Jamaican musical style. However, I would like to describe the style of Indubious as a modern one. Modern in the way that the otherwise purist interpretation is used in conjunction with other musical elements that come into play. This variant of the reggae seems to be successful and it is fitting for the band who describes themself as the ambassador of “West Coast Reggae.” The laziness, which is attached to the Reggae, is transported beautifully by Indubious and as I listen, in my head I picture the band more on the beach in California than in Jamaica. But the sound is just not on a California beach, because Indubious tours throughout the world. When you see what festivals they are already on the billing for, it might serve as a reference to see their true skill and talent: Wakarusa, Gathering Of The Vibes, Reggae On The River , Sulafest in India, Sierra Nevada Word Music Festival, Earthdance, Gaia Festival, Beloved, Britt festivals, just to mention a few. Dancehall and Raggamuffin is beside the Roots Reggae main genre of the music of Indubious on “From Zero”. The guest musicians, Sizzla and Vaughn Benjamin, whose authenticity absolutely lies in their voices, are an important part of this album. Sizzla is justified in the title “Dancehall Icon” and Vaughn Benjamin is certainly heard in Midnite and Akae Beka. Gloriously, Sizzla’s vocal outbreaks are showcased on “Golden Ones.” Also, the appearance of Zahira Soul in “Root Down” brings a special feel to the music. Many tracks also have a kind of psychedelica. By virtuosic synths, Indubious creates something like psychedelic dancehall. Reduced tempos, cellar-bass-bangles and singing down to voice-ling give the works a special flair. In addition, there are very harmonious tracks, Such as “Rocketship.” There are also pieces à la “See Sharp” in which the offbeat phrasing is lifted and the flirting keyboard sequences are intercepted. All this makes the music special. You can feel that the album is performed with heart and skill. The fact that Evton and Skip are Americans cannot be felt at any moment. Another professional component is to be seen in the producer’s name of their previous album, because Daniele Gaudi is “legendary” in this genre. The messages of the band are in a positive context. Evan confirmed this positive attitude in 2011 after a complete recovery from a double lung transplant. The ability of the band may also be recognized by whom they shared the stages over the years. In addition to Western artists such as Matisyahu, Michael Franti, Rebelution and Blondie , Black Uhuru , Stephen Marley , Junior Reid and Paton Banton are also members of reggae’s country of origin. 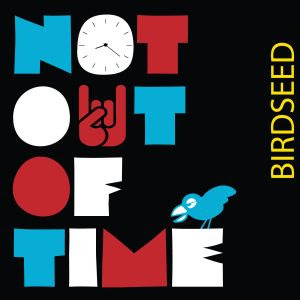 “A band from San Francisco, Birdseed, has announced their first release, the EP “Not Out Of Time”. The band was formed in 2012 and consisted of members who had more or less joined the music group through connections related to Bird School of Music in SF. The band consisted only of male members, and did not have a lead singer yet, when Kerry Landreth was invited to a contest, a ‘Battle of the Bands.’ After that, she became Front-lady Kerry Landreth. A decision that was soon to turn out to be golden. BIRDSEED will be touring in the Fall of 2017 in support of their NOT OUT OF TIME 10” Vinyl EP, which is available worldwide online and in stores August 4, 2017. “Recently, we brought the news , in which the new album “Wake Up” by the singer / songwriter Jennifer Saran was announced and now the disc is on the table. Jennifer Saran aka Jennifer Hill , who was born in the USA, lives in Hong Kong and began her singing career there. In 1992, she joined a women’s choir and took the mezzosopran with her voice. Five years later, together with other members, she left this choir and founded The Hong Kong Women’s Choir , whose main goal is to make money for charity. Under the name Nova and supported by the A cappella group Gracenotes is a preferred charity for the disadvantaged. In 2015, she made her debut with the Christmas album “Merry Christmas – You Are Loved”, and a year later, “Walk With Me”. Her career as a singer runs well, yes, more than well, because radio stations, video portals and social networks ensure enormous distribution. This is also a good thing, because a large part of their income goes to the needy of this world. Examples are the ‘Kuldeep’ Saran Memorial Trust ‘(a foundation established after the death of their husband Kuldeep Saran ), who takes care of the education and welfare of disadvantaged children in Hong Kong. Then there is still support for the Hong Kong Women’s Choir , Who is celebrating the 20th anniversary this year and Jennifer is the only remaining founding member. ‘Arts and Education for Women’ supports refugee women and asylum seekers in Hong Kong and the revenue of the single “Wake Up” goes to the ‘Desmond Tutu Foundation’ in South Africa. The woman is doing well and did so now with this album also for herself, because beside own songs, there are also cover pieces of musicians, which are dear to your heart. This naturally results in a kind of hodgepodge, because there next to Bill Withers or George Michael z. For example, a Doris Day . Jennifer’s versions, or her vocal abilities, however, make this an easy one, because it sounds perfect. Yes, actually this voice is almost too perfect for me. There is no corner or edge place, but this is now critique at the highest level. However, if one likes singing and music from a rather rocky environment, one has to fight first with the beauty of the voice. Also Santana’s guitar playing in the title track is rather subtly adapted to the well-arranged arrangements of the album. Like the South African Grammy winners Ladysmith Black Mambazo , Carlos is on board as a guest musician. The covers I know are very close to the original and especially the “Me And Mrs. Jones”, known by Billy Paul, underline the fact that Jennifer has also made a massive change to the song name. Because of the Mrs. became a Mr. and therefore also the lyrics had to be changed in the affected places. Produced was the album by Narada Michael Walden , who not only drums on “Wake Up”, but also stands next to Jennifer at the Micro. Stylistically, the album moves in a melange of pop for adults, singer / songwriter, soul as well as R & B. Hard to grasp but actually on the common denominator, the great voice, there is nothing to shake. In Rockhaushalt it will surely have “Wake Up” hard to get rotation. But if there is desire for adult contemporary music, what is fitting in the house. WAKE UP was released July 7th, 2017.